If you’d have slapped a takeaway in front of us tonight we would have taken it. Neither of us wanted/could be bothered to make this but we dragged our bums up and got on with it. It was well worth it. It was a fantastic dish, the only minus point, a baking tray that was hard to clean. Mix the pork with half the chopped chilli, some hoisin, soy sauce and most of the sesame seeds. Roll into small balls and cover and chill whilst you take the dog for a walk for half an hour. Pop them on a baking tray, sprinkle over the remaining seeds, and cook for about 15 minutes, ensuring they are cooked though. Heat the oil in a pan and add the ginger and remaining chilli. Cook for a minute then add the five spice powder. Cook for another minute and then add the stock. Add the noodles to the stock and cook for 4 minutes then add the broccoli and let it cook for a few more minutes. Add the spring onions. Original BBC Good Food recipe here. Yum. 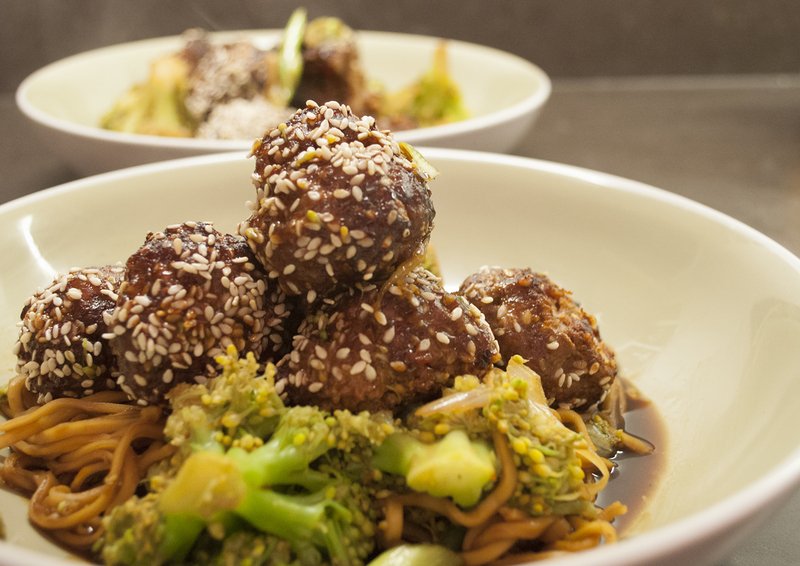 I shall coat my meatballs with sesame seeds next time I make them. Look good! Thanks. I’m sure you’ll enjoy them. I sure did! That does sound so good. Me too. This looks very nice, love the picture!